Wait! Back away from that screenshot of your Salesforce dashboard. This is your big sales presentation. You’re better than that! 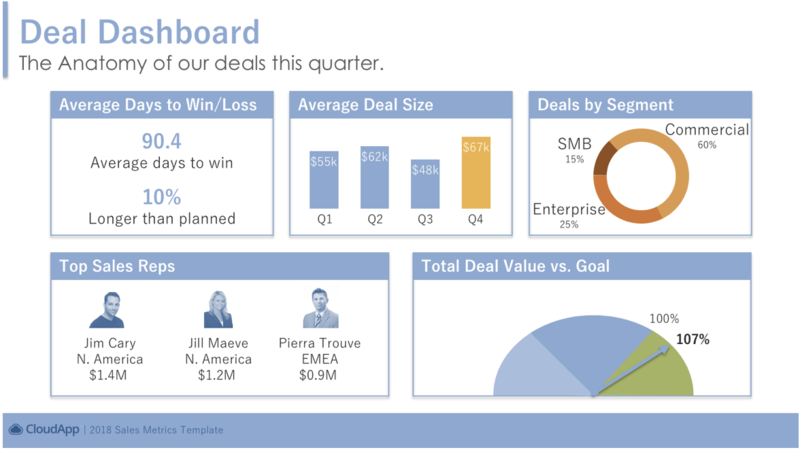 Try our new Sales Metrics Template instead for a better, brighter way to deliver your quarter end presentation. Chock full of slides such as Sales Pipeline, Sales vs. Goal, Deal Dashboards and Top 5 Deals to name a few, this presentation will have you looking your best. The slides are easy to customize to make your own. Just change up the color schemes or simply steal the visualizations you like best. Everyone loves a beautiful map. So, when you present your sales breakout by region do it with a simple yet striking map, rather than some stale old Excel grid. Make sure to note how each region performed relative to goal to give your audience proper context. Lifting the hood on your quarter is key. Great that you hit your quarter but showing people the “how” of hitting your quarterly sales goal is almost as important. Tailor this however you like. And don’t feel obligated to discuss every panel. Just stick to your top 1-2-3 points. And it’s good to keep using the same format every quarter so your audience gets comfortable with the information you’re presenting. Nobody likes to see shifting metrics. It makes them suspicious. 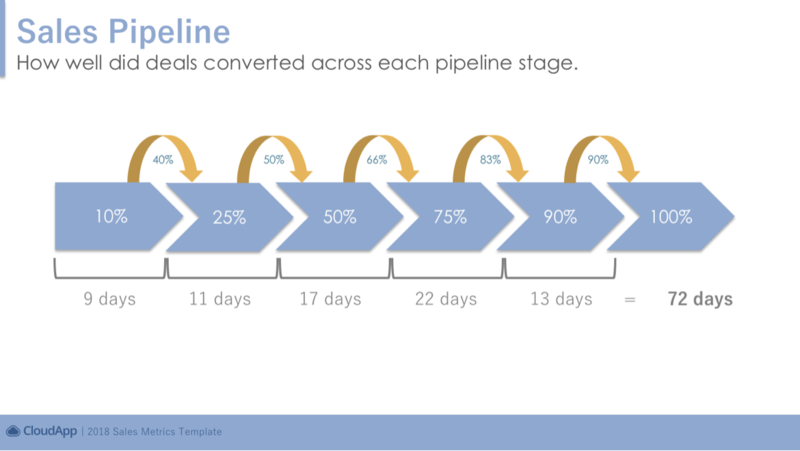 There’s no better way to demonstrate mastery of your sales pipeline than a slide like this. You know how well deals convert from each stage and how long it takes. In other words, you’ve achieved predictable sales. Even if you’re not wholly dialed-in yet, presenting the information in this way sets your audience’s mind at ease that you’re focused on the right things. We hope you find this sales metrics template helpful the next time you present to your executive team or board of directors. We look forward to providing your sales team with more interesting tools in the near future. Be sure to also check out our recent Sales Prospecting Playbook. It’s a helpful piece to get your SDRs and AEs cranking away building pipeline.